Key Difference: The Samsung Galaxy Tab 3 10.1 is named after the 10.1-inch screen that is offered on the device. The device comes with the same resolution as its 8-inch counterpart, which reduces its ppi density to 149 ppi. The device will be powered by 1.6 GHz dual core Atom processor provided by Intel and will offer 1 GB RAM. iPads have the screen size of 9.7 inches with multi-touch display. iPads are intended as devices for a multimedia experience, reading e-books, watching movies, listening to music, playing games, browsing the Internet, or retrieving e-mail. Samsung has taken a very innovative approach to try and cater every customer in the market. The company’s approach includes releasing one model and then releasing variations of that same model. Following the launch of Samsung Galaxy Tab 3 7.0 (7-inch) and Tab 3 8.0 (8-inch), the company has announced the launch of Tab 3 10.1 (10.1-inch). This particular Tab also comes in three different models that further try to please its many customers in the market. One model is basic Wi-Fi and does not offer any GSM support; the second model offers 2G, 3G and Wi-Fi support, while the third model offers 2G, 3G, 4G and Wi-Fi. This approach allows users to spend on what they need. The Tab 3 10.1 is named after the 10.1-inch screen that is offered on the device. The device comes with the same resolution as its 8-inch counterpart, which reduces its ppi density to 149 ppi. The tablet comes in the same polycarbonate that is found on the Galaxy phones and has a thick white bezel on the front. The screen has a hardware home button flanked by two capacitive buttons for Back and Menu. In landscape mode, the top of the device has the speaker and the mic. There is nothing else on the front. The sides have a metal band and also various ports including the volume rocker, microSD card slot and the charging port. The back of the device has the Samsung logo above which the rear camera is placed. The company has added certain extra features in the 10.1 inch but has also slashed a bunch of high-end features. All three models will be available with Android v4.2.2 Jelly Bean that will be customized with Samsung’s TouchWiz UX UI. The device will be powered by 1.6 GHz dual core Atom processor provided by Intel. It will offer 1 GB RAM. The Tab 3 10.1 will come with two different storage capacities 16 GB and 32 GB, which can be further expanded by 64 GB. The device also offers both rear and front cameras but has reduced the MPs offered in the rear camera to 3MP, while the front has a 1.3 MP camera. The device comes with a non-removable 6800 mAh battery. The company has also added a bunch of apps that makes the device more user friendly such as Samsung Hub, Samsung Kies, Samsung Kies Air, Samsung ChatON, TV-Out (enables users to connect the tab to the TV), etc. iPads have the screen size of 9.7 inches with multi-touch display, that provides approximately 264 pp density. The screen has a scratch-resistant glass and an oleophobic coating that keeps fingerprints on the screen and the back. iPads are intended as devices for a multimedia experience, reading e-books, watching movies, listening to music, playing games, browsing the Internet, or retrieving e-mail. It has a software structure more like that of a mobile phone. It also has a very simple user interface, which can even be easily operated by children. 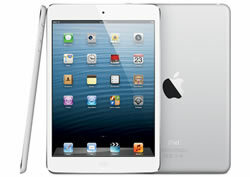 iPads are available with a memory capacity of 16 GB, 32 GB, 64 GB and 128 GB. The device runs on 1.4 GHz dual-core processor and has a 1GB RAM. The iPad has been called the best iPad of all the four generations. The iPad is powered by the new Apple A6X chipset. The device has a 5MP rear camera for taking photos and a 1.2MP front camera for video calling capability. The camera also has video recording capability and can record [email protected] and has video stabilization. The iPad has a 42.5-watt non-removable lithium-polymer battery. The iPad is available in models supporting only Wi-Fi, or 3G and Wi-Fi. However, iPad lacks Flash, software that a number of websites use to display content. So, iPad cannot load these pages. This limits the web surfing experience. The fourth-gen iPad is similar to its predecessors, while it still has two minor and one major upgrade on it. The 30-pin connector has been upgraded to a smaller Lightning connector, while the front camera has been upgraded to the HD Status. The major upgrade is the new A6X processor that replaced the A5X processor on the third-gen. The information for the detailed table about the two devices has been taken from Samsung Mobile Press website, Apple website and GSMArena.com.